From delicate, pastoral dream pop to intimate, electronic-tinged folk, the Glaswegian composer’s luxuriant vocal harmonies and intricate compositions dazzle with ingenuity. 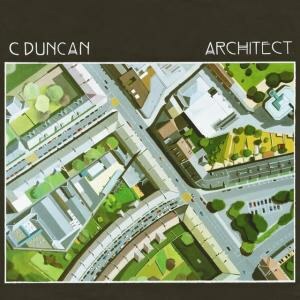 On his breathtaking debut album Architect, 26-year-old Glaswegian composer Christopher Duncan sings, “I’ll take you everywhere I go… I’ll take you everywhere I know. It’s all so wonderful.” That’s exactly what the Mercury Prize-nominated multi-instrumentalist does over the course of 49 minutes, and it’s anything but hyperbole to declare that “wonderful” is quite the understatement. From delicate, pastoral dream pop to intimate, electronic-tinged folk, Duncan’s luxuriant vocal harmonies and intricate compositions dazzle with ingenuity. The influences are easily discernible throughout Architect, but their presence rarely obscures Duncan’s own artistic voice. His lush choral arrangements periodically bring to mind Herbert Howells’s transcendent Requiem, the celestial choral works of Faure and Duruflé, and the “virtual choir” aesthetic of composer Eric Whitacre, but Brian Wilson, Fleet Foxes, Cocteau Twins, and even a less twee Harpers Bazaar also seem like comparative points of reference. The complexity found within Duncan’s compositions isn’t surprising, considering he’s the son of two classical musicians and a graduate of the Royal Conservatoire of Scotland, but it’s really the pop immediacy of these songs that lingers in the mind long after the record has ended. Architect rarely feels like a collection of songs tied together by one particular subject matter or another. If anything, they seem to be united by style and instrumental texture more than lyrical content, but beginning with the atmospheric “Say”, Duncan introduces a little theme of “leaving it all behind”. Layered vocals flicker in and out of the mix like light poking through a grey haze on an English summer’s day. It’s followed by the shimmering title track, where Duncan sings, "I'll take the plans this time, and I'll take control / It's all right now". With its whimsical, slightly off-kilter organ line and “La La La” chorus, this buoyant ditty sounds like a modernized rendering of medieval music to accompany an English court dance. Abandoning the “sites and city lights” for a little open space and quietude, “Silence and Air” picks up where “Say” leaves off thematically. An ideal track to throw on a playlist for a late-night drive, it opens with the percussive sound of clicking castanets or rattling spoons, and is joined by the sound of an insistent, arpeggiated acoustic guitar line and Christopher’s ethereal harmonies. They float into the hypnotic “For”, which could easily be mistaken for an old, unearthed folk track with its whistled melody and misty production. Duncan flirts with sea imagery on this track, introducing another lyrical theme found throughout the album. Here it’s as if the song’s narrator is staring out at a vast body of water, ruminating about the mysteries of life, while chuckling about all its humorous twists and turns. The barbershop-meets-Bacharach romanticism of “He Believes in Miracles”, the kaleidoscopic, Krautrock-tinted psychedelia of “Garden”, the post-punk, OMD vibe of “Here To There”, and the Elbow-esque “By” all dabble in different genres, but each one of them is imbued with a daydream-like ambience. These are the kinds of reverie-infused songs that can be listened to regardless of the season. Even though the moods of Architect fluctuate, Duncan’s clever vocal arrangements and the subtleties of his layered production, somehow bind everything together seamlessly. As critically acclaimed singles “For”, “Here to There”, “Say”, and “Garden” were each released in anticipation of his debut, blogs and critiques would occasionally comment on the dearth of strings found within his songs, as if their inclusion would somehow validate his classically trained background. While the aesthetic works marvelously well for other artists like Shara Worden of My Brightest Diamond, Susanne Sundfør, or Andrew Bird, it often seems like gilding the lily if executed poorly. As with every single meticulous detail on Architect, Duncan’s compositional instincts never seem to fail him, so when strings finally materialize on the cinematic “Novices”, they slip seamlessly into the fabric of the piece. Through minor-key uncertainty and crisp, percussive brush strokes, the haunting “Novices” captures the inner turmoil and nervous excitement of two lovers embracing an uncertain future. Introspective and dreamy like early Beach House, it drifts into the diaphanous choral “oohs” of “As Sleeping Stones” and then into the bittersweet tenderness of the album’s final track “Ill Be Gone By Winter”. Like one of Vashti Bunyan’s gossamer lullabies or a delicate Ed Harcourt ballad, he sings, "How slow the nights go, when you don’t come around anymore / I’ll wait for daybreak in the grey". His voice sounding startlingly similar to that of Canadian troubadour Ron Sexsmith, Duncan closes this stellar collection of songs singing, “Goodbye goodbye”. For over a year the singer-songwriter isolated himself within his bedroom studio as he crafted the album’s 12 songs. Unencumbered by time constraints or the influence of outside producers, Duncan painstakingly layers guitars, synths, handclaps, found objects and vocal lines on top one another. The resulting product is astonishing, not simply because of how disarmingly beautiful it all is, but more that the record is the result of one man’s labor of love, not the work of an entire studio full of musicians. These songs breathe with life. Timeless, genre-defiant, and endlessly inventive, Architect is as accomplished a debut as any in recent memory.